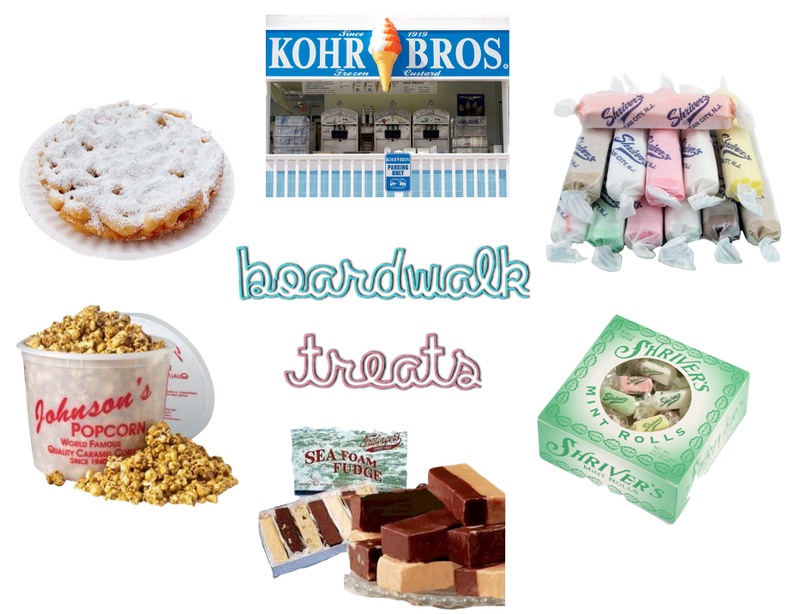 Favorite Things – Boardwalk Treats Edition! Shriver’s Mint Rolls – Another win from Shriver’s! Their mint rolls are reminiscent of the little after dinner mints you used to find in your grandparents’ favorite restaurants or as bridal shower favor takeaways, but with a very lovely and unique texture. Fralinger’s Sea Foam Fudge – This was always our family’s special splurge. Dad was smart enough to pick a nutty variety because us kids wouldn’t touch anything with nuts in it! Peanut butter was a favorite, but good old fashioned chocolate always took the cake. Johnson’s Popcorn – We always had to hollow out a spot in the station wagon to fit a tub of Johnson’s caramel corn… which we tried fervently not to devour on the ride home. Funnel Cake – Fried dough with powdered sugar on top. What’s not to love?! Watch the seagulls though. They’ll swoop down and take it right out of your hand! What are some of your favorite nostalgic summer vacation treats? Tags: boardwalk, caramel, chocolate, cone, custard, family, favorite, fralingers, fudge, funnel cake, johnson's popcorn, mint rolls, new jersey, ocean city, orange, popcorn, salt water taffy, shrivers, snacks, summer, swirl, treats, vacation, vanilla. Bookmark the permalink. Previous post ← Maker Faire 2014 – The Lego Jeep!